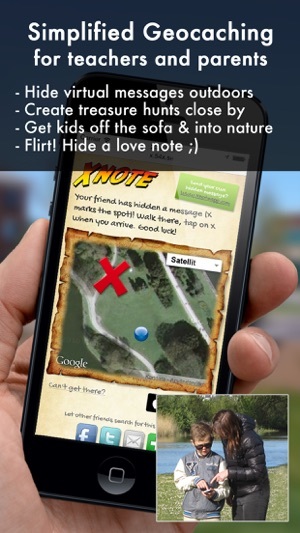 Xnote is a virtual take on geocaching that let kids (and adults) go on simple treasure hunts outdoors for virtual messages. Kids love the excitement of a treasure hunt. They get to experience nature and learn about geography, mapping skills and teamwork while having great fun. Xnote can be a practical and convenient alternative to regular geocaching for teachers and parents since virtual treasures can be hidden near home or school by just pressing a few buttons. 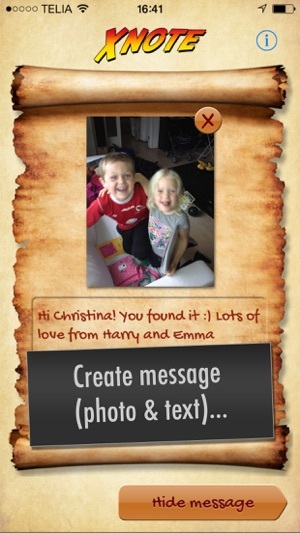 Treasure hunts can also be sent to friends and family as a fun challenge. Study after study shows that time spent in nature increases happiness, health and well-being in kids . However, modern kids have lost touch with nature and the outdoors in just one generation argues projectwildthing.com. Technology can be a great way to sell the outdoors. One exploratory study suggests that technology may help engage children in outdoor activities . Use Xnote as a bridge between screen time and outdoor activities by sending the kids on an exciting treasure hunt. Get them off the sofa and into nature. Leave room for free play once out there with time to explore, imagine and create which is great for building confidence, creativity and independence. - Hide scavenger hunt assignment such as "Collect five different types of leaves" or "Climb the tree and take a photo from above" in a park or a similar place close by. 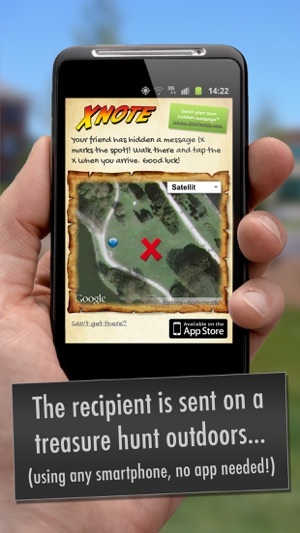 - Hide a message in the schoolyard of a partner school, messages can be hidden anywhere in the world! 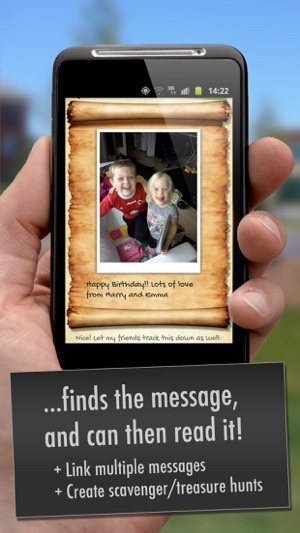 - Hide a greeting card to celebrate when something special has happened. - Hide a fun photo outside a friends home. 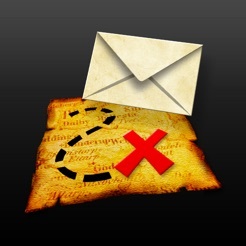 Anyone wishing to be more advanced can easily link messages together and thus create quiz walks, tours and treasure hunts (more info at www.xnoteapp.com). Create for example a quiz walk with science, math or nature questions. 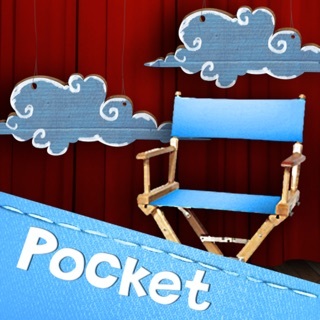 You, or your children, use the app to hide your own virtual message (instead of physical cache). You then send the message to yourself or someone else who must physically go to the right spot before the content can be viewed. Send the hidden message via Facebook, SMS, Email or any other social app. The person you send to can use any Smartphone or Tablet with GPS and internet access to find the message. No app is needed since the Smartphone's browser is used. This means you can surprise friends and family by just sending them an Xnote, they will get simple and clear instructions explaining what this is and what to do! It will not cost them anything. Note! GPS is needed to find messages. iPads with only WiFi has no GPS and can thus NOT be used to track messages. All iPhones and iPads with 3G/4G as well as most Android and Windows devices can be used. Start by sending a message to yourself to see how it works! - When friends check in on Facebook/Foursquare, stow a secret message nearby. - Create simple games to enhance a party, or event. Add clues that lead to prizes stashed nearby. - Going to a festival or concert? Hide a message for many friends using Twitter or Facebook wall. - Fresh, fun marketing for your company or event using Facebook, Twitter, Email or the web. Create activities such as treasure hunts, quiz walks and tours for your visitors. Unique and fun way to send messages! 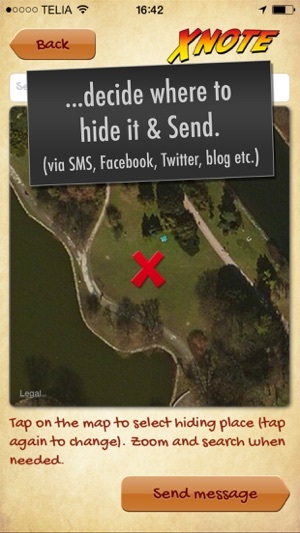 A social, virtual take on geocaching. I live far from my family, but I've been using this app to leave messages around my nephews neighborhood. It's a fun way to keep in touch. App does not work. When typing there is no curser or print to be seen.